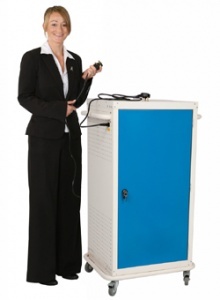 Thanks to the popularity of portable computers there is huge demand for storage units that can house these devices. 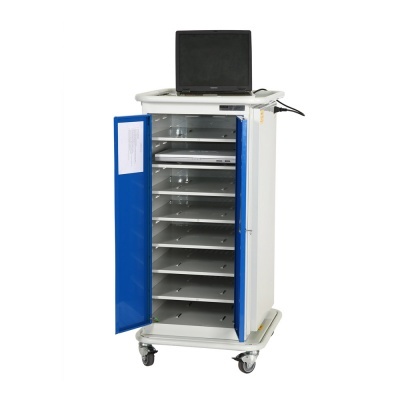 We offer an extensive range of both laptop and tablet charging trolleys that provide secure mobile storage and charging facilities. 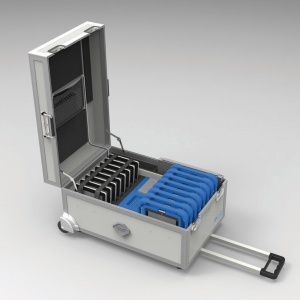 There are small laptop charging trolleys for 8 to 10 devices and even larger trolleys that can house up to 32 laptops/tablets within one compact unit. Take a look through our range, further information is available at the bottom of the page, if you have any queries please call us on 01993 779494. With the huge advances in technology over the past five years, laptops have increasingly taken over from the traditional desktop computer - providing similar power and specification whilst remaining light and compact enough to carry around. More and more schools and colleges are turning to these portable devices as an everyday learning tool, laptop learning not only helps students develop their computer skills, it also helps teachers create and deliver more innovative and engaging lesson plans. 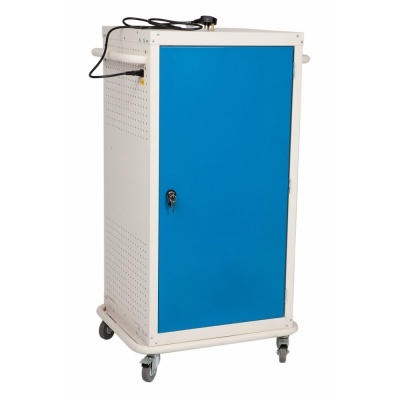 Where there are a number of laptops that need be stored and recharged, laptop charging trolleys provide the perfect solution. 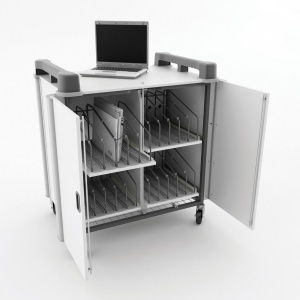 With these practical laptop trolleys, charging the devices is super easy thanks to the supplied 3 pin plug socket in each compartment. They are the perfect solution for storing and moving laptops securely and are ideal for ICT departments in schools and colleges. 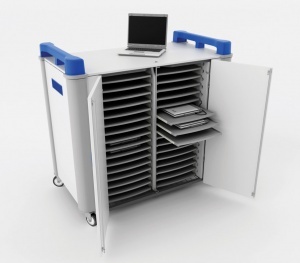 Individual charging bays ensure that each laptop has enough storage space and is suitably protected from the others. 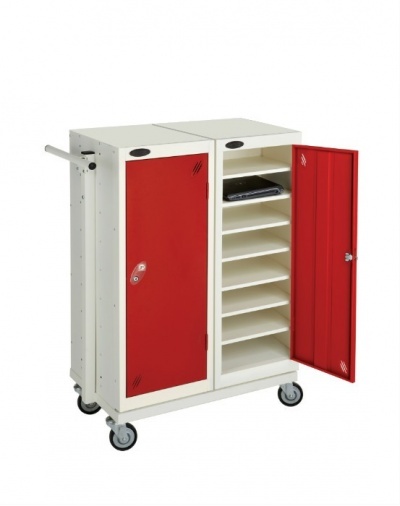 Lockable doors and wheels provide added security and stability. 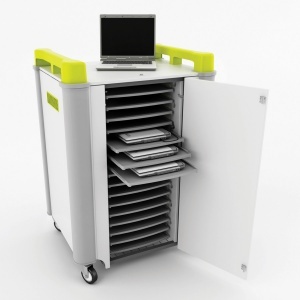 Our range of Laptop store and charge trolleys are an excellent solution for any educational institution. Devices can be stored inside the unit when not in use and be fully charged and ready for their next use. The sturdy metal or plastic construction provides a long lasting piece of IT equipment that offers great value for money. 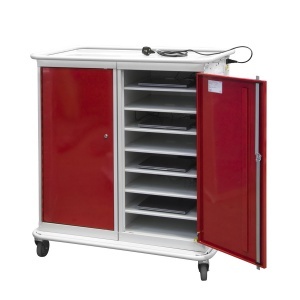 All our laptop recharge trolleys are CE certified and adhere to strict safety rules helping to protect end users from any potential electrical danger. 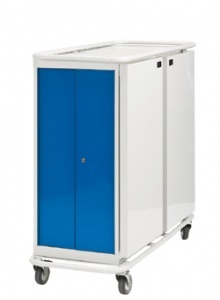 We recommend that the charging trolleys are well maintained and inspected on a regular basis to ensure the on-going safe operation of the unit. Where the units are transported and used frequently, careful attention must be paid to the condition of flexible cables, plugs and associated electrical equipment. Children can be encouraged to tidy up at the end of the class by allowing them to return their individual laptops to the storage trolley, however we recommend that children must always be supervised by an adult and that the electricity supply is fully isolated. The official HSE safety notice regarding the use of charging trolleys can be viewed by clicking on the image (right).